Moments after stepping off the plane in Grand Rapids and finding the airport’s rental car office, I was face-to-face with a friendly Dollar representative. She casually asked what brought me to Grand Rapids. No explanation was necessary for the latter statement. Michigan—like most of the midwest United States—had been subjected to something climatologists dubbed a Polar Vortex since early in the week, casting record-low temperatures to the tune of -30 degrees Fahrenheit (-50F with wind chill). Such weather could give people a nasty case of frost-bite within a mere minute, so entire businesses and whole cities shut down for days. 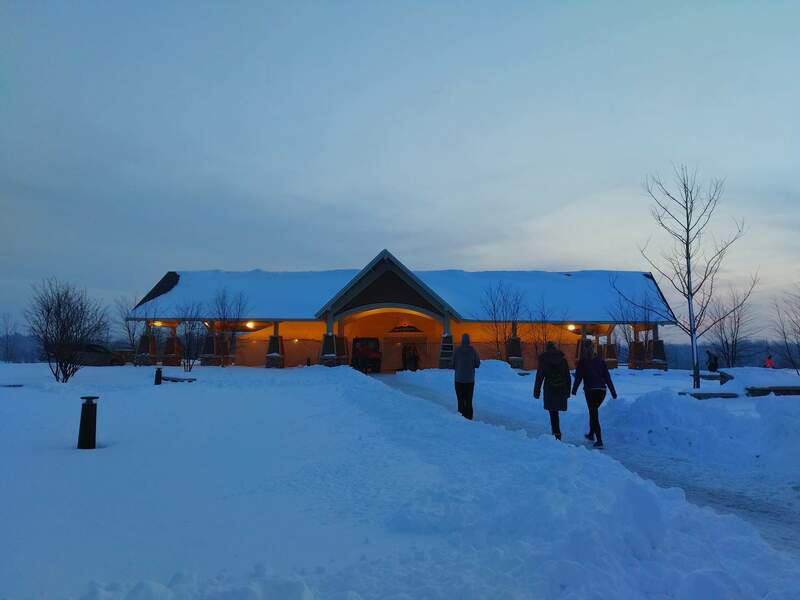 When I had arrived, all corners of the Mitten State was covered in snow—in some places, several feet of it. The temperature was not forecast to rise above water’s liquidification temperature until Saturday, which just so happened to be the day of this race. Now, Polar Vortex or not, Michigan is bound to be cold at the beginning of February. Why run a marathon there at this time of year? First, just about all of the remaining marathon states that I have not run were in the north—especially since running in Mississippi last weekend. (Only South Carolina remains for me in the south.) 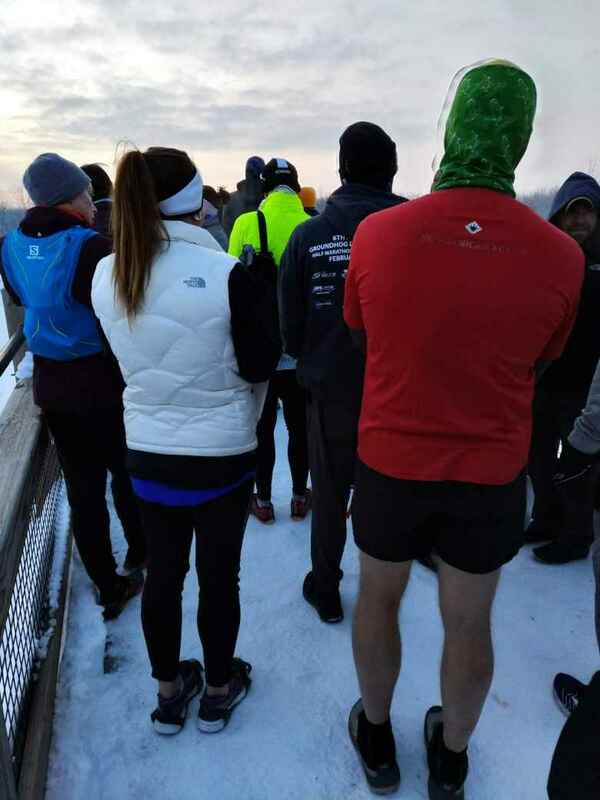 I hadn’t run any marathon states last year and wanted to do a couple this winter while I had free weekends, and Michigan was one of the few options. 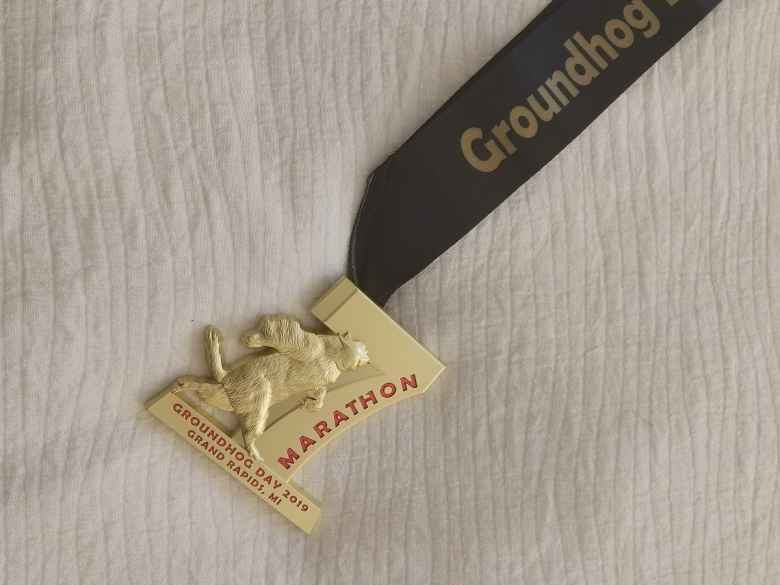 Third, I had never done a winter marathon. 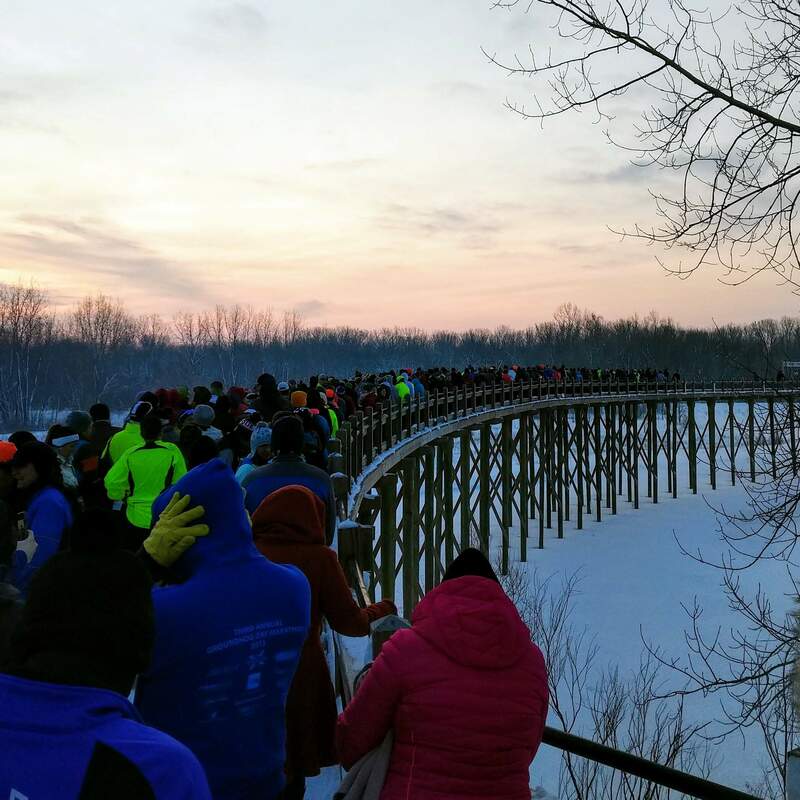 I mean, a true one: a 26.2-mile race where not only you can see your breath, but you are running on crunchy snow. And bundled up with a facemask. 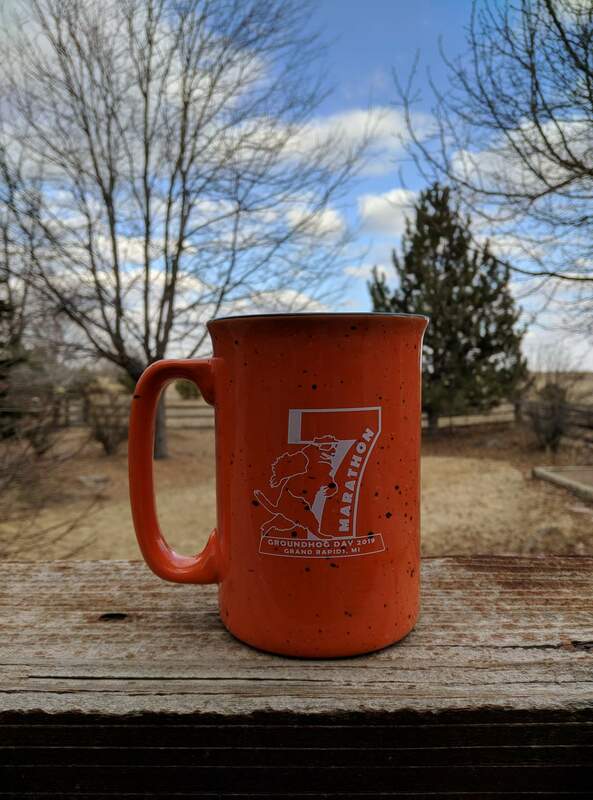 The closest thing to a winter marathon that I had done was the Reindeer Marathon in Albany, Washington, and that only had rain—not fluffy white stuff. I even watched the classic Bill Murray comedic film Groundhog Day that the blurb above alludes to. Good way to set the stage for running laps through a snow-covered park over and over again. I took a lacksadaisical approach to the start, as evidence by standing in the line for the portapoties only four minutes from the official race time of 8:00 a.m. “Don’t worry, it’s chip-timed,” I assued a guy behind me, who seemed a little anxious. A downside to this approach was having to begin way back in the field of approximately 450 participants for the joint-start of the half- and full marathons—particularly since the start was held on this bridge. Being a gentleman, I didn’t push and shove through the crowd to get closer to the front, and hence was slowed considerably during the first mile of the first of six 4.4-mile laps through Millenium Park. In fact, Mile 1 would be the slowest mile during the whole race. It passed in 10:25. After that, runners became spaced out enough to run through them without requiring the agility of an NFL running back. At about this point I passed Steve Ruppel of Wausau, Wisconsin, who was trying to set a world record for number of t-shirts worn during a full marathon. He had so many shirts on (reportedly, 60) that he looked like the kid in A Christmas Story whose mom over-zealously dressed him so that he couldn’t even lower his arms. He was flanked by two guys wearing fluorescent green reflective vests bearing the words “official record attempt.” I’d lap them two more times before Ruppel, it appears from the official results, stopped at Mile 13.1, or 13.1 miles short of his goal. During the first lap I thought of my own goal. I thought it would be nice to finish under 4 hours, but was not very optimistic of the prospects of doing so. Even after pushing the pace during Miles 3 and 4 and the Garmin still was not registering splits under 8 minutes per mile. While the trail was plowed the previous morning, there was still a couple inches of snow left on it, presumably to leave a safer surface for running than a part-bare/part-icy one. Traction wasn’t terrible, but the snow absorbed energy much in the way sand does when you run on the beach. It also was hard to tell which was the “best” part of the trail to run on, and thus I was not always taking the shortest line. Sometimes I’d try to run on the four-inch-wide tire tracks of what was presumably a small, golf-cart-like vehicle that had plowed the trail the day before, but they were weaving quite a bit, as if its operator had drunk a few too many beers. Following the footprints of other runners was worse as the kicked-up snow left an even more inefficient running surface to run on. 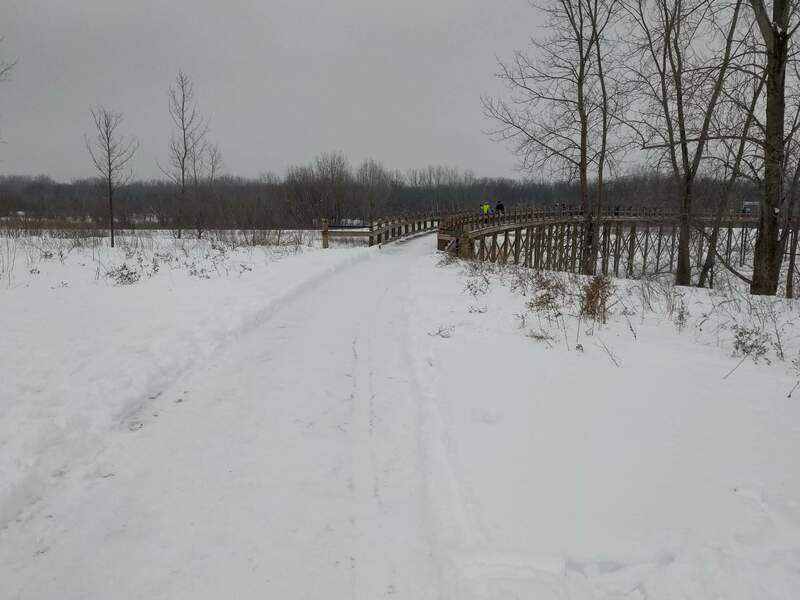 Ultimately, I settled on running along the undisturbed parts of the trail. I had no problems with slipping except for a face-palm moment after the second lap. At the end of each lap, you had to do a tight 180-degree turn around an orange cone, which was on the wooden bridge that the start/finish timing mats were at. Well, it was icy enough that the feet completely slipped out from underneath me when trying to head the other direction and I completely landed on my left side. Oops! I smiled and waved at runners who witnessed this to indicate all was ok. The next time I passed by that point was the halfway mark. 1:56 elapsed. This meant that I had 2:03 to achieve a sub-4-hour finish, which was within the realm of possibility but not particularly likely. In the last marathon I did, for example, it took me 12 more minutes for the second half than the first. Still, I wanted to keep pushing to go for that goal. This was aided at the start of the next lap, when a volunteer providing encouragement shouted out, “What lap are you on?” “Lap 5,” I replied, only to hear the same thing echoed by a female runner a few steps behind. Finally, for the first time since Lap 1, I was running close to another runner who was running the full marathon instead of the half at a similar pace. I fully expected her to pass me at some point, but focused on pushing the pace and even picked up the pace for a few moments whenever I’d hear her footsteps right behind mine. I finished that lap with a handful of peanut butter-filled pretzels, as I was starting to get tired. At the start of the final lap, it looked like I had 42 minutes to run the final 4.4 miles. Unlike in last weekend’s marathon, none of the leg muscles were cramping, but they were definitely tired and maintaining a sub-10 minute/mile pace was not going to easy. “Yes, I was really motivated to try to finish under 4 hours,” I replied. As it turned out, I was able to pick up the pace just enough the final 4 km to give myself a fighting chance to beat the hour mark. The final 300 meters it looked like it was possible, but the finish was uphill and I knew that it would take a frenzied sprint to squeak in just in time. Which I did! Per the Garmin, I finished 9 seconds under 4 hours. My official chip time was 15 seconds under. Either way, I’ll take it. Running a marathon in Michigan in February was not such a horrible idea after all.